"It wasn't a dream. It really happened. Again." Open Road Films has also debuted a new Sundance trailer for the sci-fi film Before I Fall, from filmmaker Ry Russo-Young, which is premiering at the Sundance Film Festival next week. Adapted from Lauren Oliver's novel of the same name, this time loop story involves a high school teenager - played by Zoey Deutch - who ends up dying at the end of the night, only to wake up and restart the same day, which gives her a chance to "question just how perfect her life really was." The cast includes Halston Sage, Jennifer Beals, Logan Miller, G. Hannelius, Elena Kampouris, Diego Boneta and Alyssa Lynch. This still looks like a cheesy YA movie, but I'm hoping there's something more to it, even just smart lessons to learn, or else why would it play at Sundance. Only time will tell. Take a look. 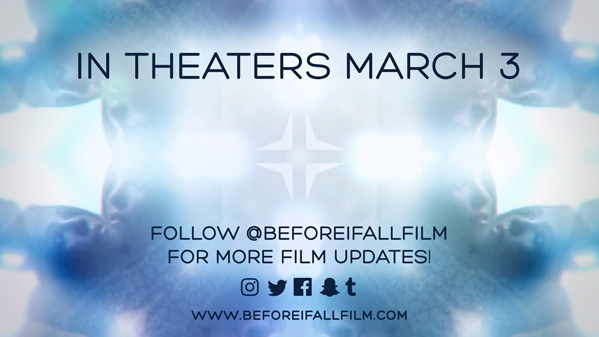 You can still watch the first official trailer for Before I Fall here, to see even more footage from this film. What if you had only one day to change absolutely everything? Samantha Kingston has everything: the perfect friends, the perfect guy, and a seemingly perfect future. Then, everything changes. After one fateful night, Sam wakes up with no future at all. Trapped reliving the same day over and over, she begins to question just how perfect her life really was. As she begins to untangle the mystery of a life suddenly derailed, she must also unwind the secrets of the people closest to her, and discover the power of a single day to make a difference, not just in her own life, but in the lives of those around her—before she runs out of time for good. Before I Fall is directed by filmmaker Ry Russo-Young, of the films Nobody Walks and You Wont Miss Me previously. The screenplay is by Maria Maggenti and Gina Prince-Bythewood, adapted from Lauren Oliver's novel. Open Road Films will open Before I Fall in theaters starting March 3rd, 2017.